At this age just using a marker is fun in and of itself...the whole thing was a fun activity...took up about an hour of their day, it could have been shorter or longer depending how much fun they were having and how long their interest was held. What you see here is a short part of it, but enough to give you the idea. I set up trays of blocks for them to count three different times...some days just one set is enough others times more or less...depending on their mood. Make it fun, not work...stress the concepts not the facts, mathematics is NOT computation. Remove the no from the lesson. If they give an incorrect response make them count again; tell them what they DO have not what they don't have, change the thinking from "wrong" to "acquiring more information." Remember, it takes 18 exposures to get information back out again. We know that with one exposure the information is indeed stored but retrieval is hard, but after 18 exposures we can get more information from short term to mid term memory, and with more exposures we can move it into the long term memory and with yet more exposures we can make that information available for instant recall. Begin exposing your students to mathematical concepts EARLY. You will need to keep exposing them year after year for them to attain mastery and instant recall of things like addition and subtraction facts, multiplication, division and so fourth, but again you haven't taught them mathematics per se, just facts and computation skills which are how we do mathematics. "Reality is consciousness, consciousness is expressed with language. Mathematics expresses reality numerically." ~me, standing on the shoulders of Terrence McKenna and John Paulos. Nanos gigantium humeris insidentes. 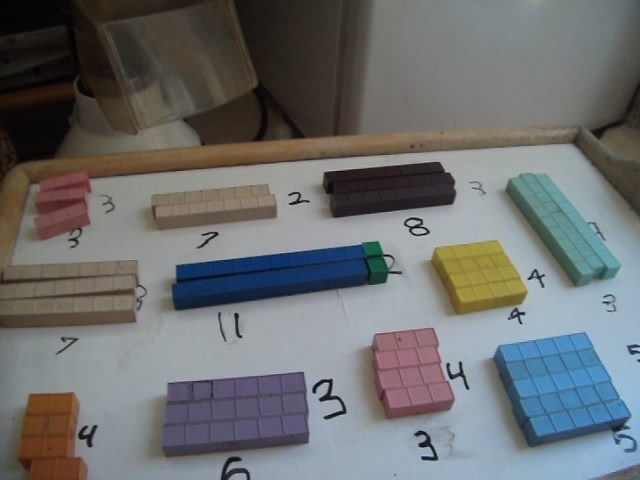 They have played with squares and rectangles before counting and building, here we begin introducing some symbols, later we will introduce more concepts and symbols so that we can write simple sentences like (3)(6)=18, 18÷6=3, 3x=18 and the symbols will make sense. It took about two sessions to clear all that up and get into negative expressions and I earned a couple hundred bucks in the process. (4 x $25 x 2) and people cannot understand why I find it all so ridiculous now...yet the parents and teachers both failed to explain it in a way they could grasp easily...and in the case of the parents some didn't even try, as soon as they see algebra they throw up their hands and say things like "well, I was never good at math so..." or "I get it but I can't explain it..." or "I don't remember any of that stuff even though I passed calculus with a B"....and are shocked when I tell them I failed calculus. FAILED IT. Not even close. Good thing I did. I can feel their pain and understand why it is they don't get it because I have the benefit of having been taught both ways. One way works and the other...uh, not so much. These same kids play with 3rd power algebra, fractions, percentages and more. The ability to do all of that consists of countng to 9, being able to tell if something is same or different or not and being able to identify a rectangle. More sample math lessons, tools and information are available at the house of math.